It doesn’t take much to envision a certain wide stretch of Los Angeles’ West Adams Boulevard in its early 20th century glory—when traffic floated by at a genteel pace and carefully spaced rows of stately homes peeked out from sumptuous gardens. Taken together, it embodied the sweet dream of the West. From its easterly end in downtown Los Angeles to its western reaches just beyond what is today Crenshaw Boulevard, the historic West Adams District was home to early film stars like Theda Bara and Roscoe “Fatty” Arbuckle, as well as key Los Angeles power brokers such as oil tycoon Edward L. Doheny and his wife Carrie Estelle Doheny. Some years later this enclave would become home to many African American celebrities of the day; property owners included actresses Hattie McDaniel and Louise Beavers, as well as the Nicholas Brothers, the acclaimed tap-dancing duo. 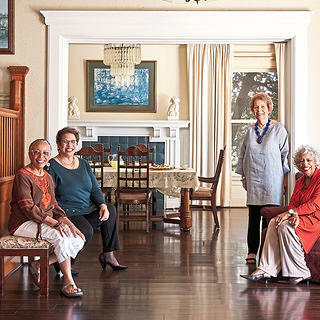 This was about the time that the members of the Wilfandel Club—51 resourceful and upwardly mobile African American women who were challenging assumptions about black Los Angeles—would take their run of a stately house at 3425 West Adams. The white, terracotta tile-roofed Mediterranean Revival residence, built in 1912, stands at the northeast corner of Adams and 5th Avenue, set back from the boulevard with a bright apron of green lawn leading to its broad porch. The Mediterranean Revival house was built in 1912. I visit the Wilfandel Club on a late-summer morning, but a crisp sea breeze suggests that here in Southern California, fall is near. Carole Kaiser, the club’s current house chair, swings open the heavy front door. In the foyer, a young woman in leggings and a dark hoodie, hair smoothed back in a ponytail, stands in a pool of sunlight with the house’s events manager, Robert Brooks. She’s training her smartphone, in video mode, on her pathway—first the foyer, then the living room, dining room, and kitchen. “For my fiancé,” she announces, breaking into her on-mic room-to-room narration. She’s scouting locations for her wedding, and the Wilfandel is high on her list. Stained-glass windows let light into the upstairs seating area. The club rents its space for bridal and baby showers, weddings, graduation parties, and often, as the neighborhood demographics continue to cycle forward, quinceañeras. I imagine women and girls swanning around in their flowing dresses, ascending the staircase, pausing for pictures. For seven decades now, this house has served as a repository of memory, a place to stage one’s milestone moments that become, along with pressed flowers, the stuff of scrapbook memories. Generations of African American Angelenos have grown up here, attending or throwing sweet sixteens and tea parties. It sits at the heart of a very particular African American experience in L.A. These are the sorts of sunlit rooms where, if you stand quietly and close your eyes, you can hear the clatter of china and the volley of laughter from long ago; it’s part of the house’s patina. History circles it, in commendations and photos of its founders. 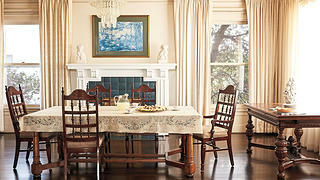 Here are Della and Fannie, posed behind the stretch of lace-draped dining table. Kaiser and I wind upstairs, past a seating area with a view of the verdant backyard. Then we take a peek into the Groom’s Room, where men gather to suit up for wedding ceremonies. After sweeping past a conference room, Kaiser ushers me into the Bride’s Room—rose pink, spacious, and absorbing plenty of L.A.’s famous powdery light. 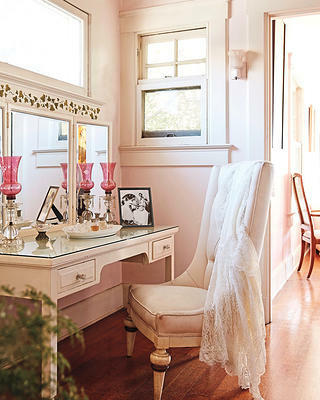 From a vanity table in an adjacent dressing room, she lifts a framed black-and-white photo: “This is my wedding.” Immediately recognizable is the layout of the backyard where the dazzling bridal party stands—and of course, Kaiser’s sunny smile. In addition to serving as a staging space for life events, the Wilfandel still functions as a clubhouse. Now back up to 41 active members after shrinking to 33, the club meets, as the bylaws stipulate, nine months out of 12. And along with the showers, weddings, and repasts the women book, they are busy fundraising for charities and scholarships. The Wilfandel has donated to the NAACP and the American Cancer Society, among other organizations. It also offers the space to nonprofits, including the neighborhood council, for a reduced or waived fee. A photo of Kaiser on her wedding day at the Wilfandel Club. Kaiser remembers coming to the Wilfandel for years, beginning when she was a teenager. “My very first time, it was a formal tea. We wore hats. Later it was fashion shows and parties and semi-formals. I am so proud to say that I was able to be part of all of that.” But amid the glamour, she reflects, “those were scary times. Not all places were safe for black people to go.” That was the trouble with trying to live the Los Angeles dream. Since taking over as club president in 2016, Liza Scruggs had been looking for ways to both address the challenges of the house’s upkeep and consider creative ways of connecting with the changing surrounding community. She’d first gotten wind of the AACHAF grant through Alison Rose Jefferson, a heritage conservation consultant and scholar who has long studied the African American experience in Southern California. “[When] I heard about the grant, I got on it,” Scruggs says. While the grant has enabled the club to make needed repairs, it also has inspired more comprehensive thinking about what the Wilfandel will be (and mean) for the future—carrying Della and Fannie’s dream into the 21st century. 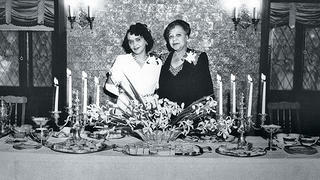 Founders Della Williams, left, and Fannie Williams, right, led the process for the purchase of the clubhouse in 1948. One of the remarkable things about the Wilfandel legacy, says Scruggs, is the founding members’ prescience in purchasing the house. “These ladies were real visionaries to get this property.” So many longtime residents in present-day L.A. have begun losing their footing in neighborhoods despite their deep roots; it’s all part of the many waves of gentrification that pass through and remake neighborhoods just like this. Acquiring this formal space was a goal both practical and symbolic for the women of the Wilfandel Club. “Nobody knew in 1945 where we were going with civil rights and with it access to certain kinds of environments. You never knew [when] you’d walk in if people would be nice or rude,” says Jefferson. Still, change pushed back, a corrective coming in swift waves of African American western migration. The Bride's Room, where generations of women have prepared for their weddings. The dining room still has its original tiled fireplace and carved mantelpiece. In West Adams, as both Kaiser and Scruggs remembered, black professionals, entertainers, and activists were buying up property: John and Vada Somerville, founders of the famous Dunbar Hotel on Central Avenue; Norman Houston, president of the black-owned Golden State Mutual Life Insurance Company; singer and actress Ethel Waters. Part of the area was eventually dubbed “Sugar Hill” by locals, as a nod to Harlem’s upscale neighborhood. As Della and Fannie hunted for a clubhouse, Sugar Hill and its tony environs continued to be the target of a campaign by racially intolerant neighbors, who were dead set on invoking the existing policies. In 1945, eight white Sugar Hill residents sued to evict their black neighbors from their own residences, arguing that if restrictive covenants were not enforced, lower property values and racial clashes would follow. The black residents fought back—and won—with the help of African American attorney and NAACP activist Loren Miller, who represented them in what would become a landmark civil rights lawsuit. With this watershed effort as the backdrop, the charter members of the club secured their spot in L.A. history. The Wilfandel Club was officially incorporated on June 5, 1947. As lore has it, the attorney handling the details of the incorporation suggested combining parts of Della’s and Fannie’s first and last names—and thus the organization would formally become Wil-Fan-Del. 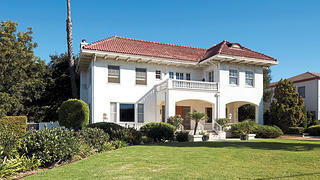 Built in 1912 for developer Percy Clark, the house was purchased by the Wilfandel women in 1948 for $28,000. They made a down payment of $10,860, and the mortgage was paid by the club’s 10th anniversary. After almost a year of renovations, the first meeting was held November 21, 1948. 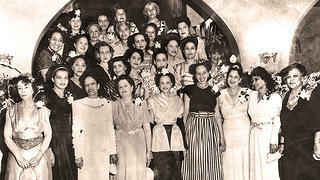 Early club members, including founders (at right) Della and Fannie Williams. With time, as business and leisure options opened up for African Americans, the idea of social clubs as a focal point shifted. Still, the Wilfandel has a cachet. Like so much of Los Angeles, West Adams is part of L.A.’s complex gentrification wave. The neighborhood is being “re-discovered” as a hidden gem rich with L.A. history and gorgeous housing stock: California Craftsman and Queen Anne, Gothic Revival and what preservationists say is the last remaining Greene & Greene-designed house within city limits. In that mix, there is a dreamy, quintessentially Los Angeles quality about the neighborhood. Della Williams’ granddaughter, club historian Gayle Harvey Beavers, agrees heartily with the outside-the-box thinking; she knows that’s at the root of how the Wilfandel Club came to be. Want to learn more about the historic West Adams neighborhood in Los Angeles? Marcus Scribner, Tia Mowry-Hardrict, Phylicia Rashad, and Aldis Hodge share stories of the places that matter to them. Beavers is working on an application to have the house added to the National Register of Historic Places. Like Scruggs, she’s putting efforts into recruiting new members. “I don’t care if you’re 95 or 35, if you can bring it, then I want you,” she says. 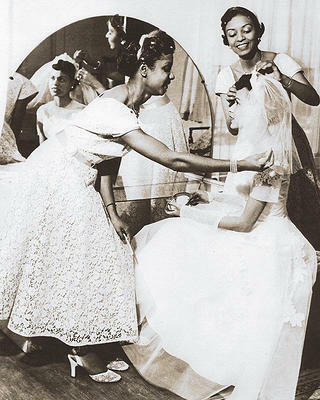 The vanity table in the Bride's Room still welcomes brides today. Lynell George is a Los Angeles-based journalist and essayist. A former staff writer for LA Weekly and the Los Angeles Times, she is also the author of two books, No Crystal Stair: African Americans in the City of Angels and After/Image: Los Angeles Outside the Frame.